A trio, one which has already been posted by itself. 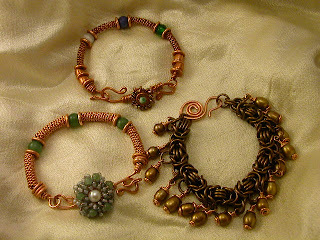 The one with the white, blue and green beads was the first bangle of this kind I had made. The Chainmaille and pearl bracelet is one I enjoy making though all the pearls have to be re drilled to accommodate the 20 to 18 gauge wire I use to "dangle" them.. time consuming and a bit dangerous as I use a dremel and hold the wet little pearls in my fingers as I expand the holes! So far NO mishaps! Wooo Hoo! In this picture the color of the pearls looks rather "mustardy" They aren't they really are a lovely goldenish color. These are fun to wear and make a distinctive clicking noise that at least to me is rather soothing.